The number one city for shopping in Istria is of course Pula. The city is by no means a shopping Mecca like Paris, but you will at least find everything you would need during a holiday. On the map below you can find all larger supermarkets in Pula, in addition there are several smaller supermarkets and local kiosk spread over the town. At these supermarkets you will find all daily goods. The only “shopping mal” in Pula is Mercator. In the mall you have a Mercator supermarket and about 10-15 smaller shops. Which is the cheapest supermarket in Pula? Well, that depends on what you are shopping, from my experience I would recommend LIDL. The Flanaticka Ulica (See map) is the main shopping street in Pula. Here you will find a variety of shops selling clothes, shoes, cosmetic etc. from local and international brands. The Flanaticka Street is car free zone, and apart from the shops you will also find plenty of coffee bars with outside serving here. 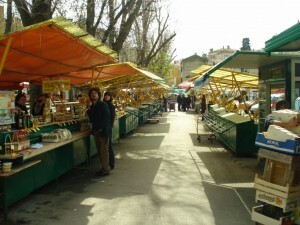 The green, fish and meat market in Pula is situated at the beginning of the Flanaticka Ulica. The outside area is dedicated to the green market where you can mainly buy locally produced fruit and vegetables, which means the selection varies depending on the time of the year. Inside the market hall you can buy all kinds of fresh fish from the Adriatic Sea; normally the selection of fish is very impressive. In addition to fish you can also buy fresh meat inside the market hall.